We took our analysis of 50,000 triathletes competing in 25 Ironman triathlons, and went deep into the race divisions to define the hardest races by age group. 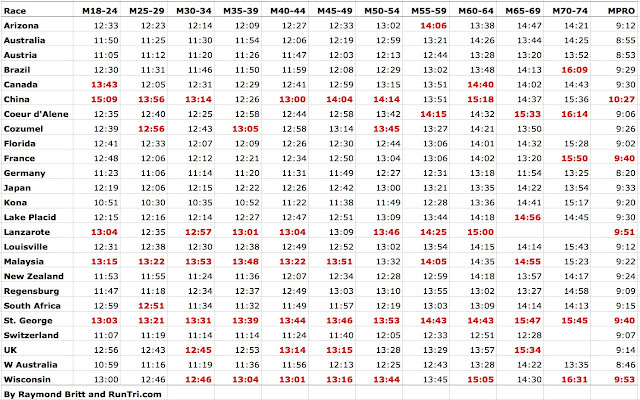 Here are the results for men; top 5 hardest per age group are highlighted in red. By Raymond Britt. Click on chart to see full-size table. For further details and links to data for each race, see Detailed Comparisons between races. For similar comparative charts, see our Toughest/Easiest Swim, Bike, Run and Overall analyses.